2 Bedroom Home on waterfront lot. Fenced yard. Private cul-de sac location. Lovely manufactured older home in NW Tampa residential community (not a trailer park). 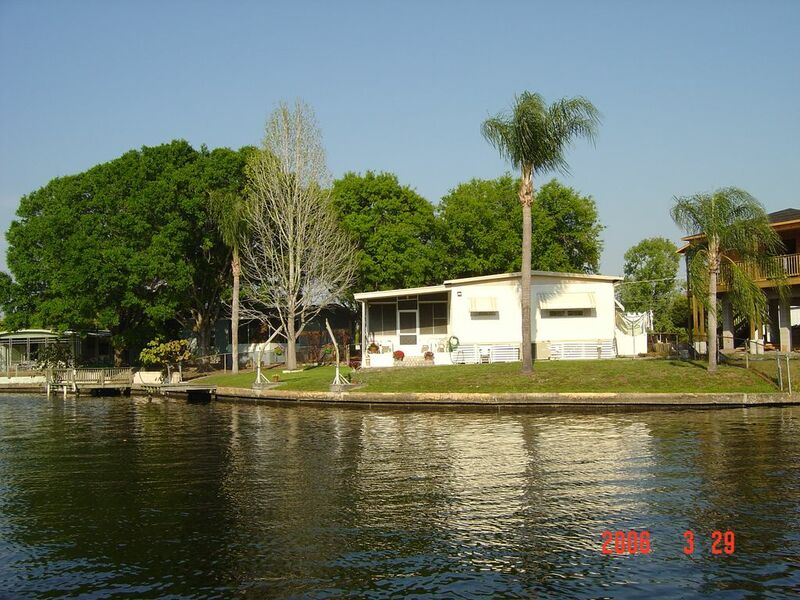 It is situated on a Rocky Creek saltwater canal that leads into Tampa Bay. Available by Days, Weeks or Months. Flexible check in day. Please check availability Calendar. The parking is actually a car port. Kayaks available for adults use only. We so enjoyed our stay. We sat on the back porch every day, morning and night. We also loved your home away from home. Thank you for your kindness the day of our arrival. I would suggest you to anyone who asks. I hope you have a blessed day. Magnificent property, extraordinary view, very safe neighborhood, gracious and amazing host! Following a family tragedy I was looking for a peaceful safe haven, a place to stay over Christmas with my dogs. The fact Pointe Place had its own garden and was situate on the water - plus very close to Publix, Ross, and many dining spots and other stores made this charming large and spacious home the perfect choice. The dining room has an elegant chandelier with glass display cabinets full of china and crystal, the living room houses two immensely comfortable large couches, books, lampshades, and beautiful drapes. The two bedrooms have walk in wardrobes and foam memory mattresses with heaps of pillows and quaint throws. The two full bathrooms have hotel-sized mirrors, and throughout the home there are numerous decorative touches that include lampshades and pictures, a washing machine and dryer, masses of cupboards and - amazingly, a huge sun room with more plushy deep couches and a beautiful coffee table. The sun room leads out to the back porch with a BBQ machine and glass lunch table and chairs. Here you can sit and admire the towering palm tree in the garden and the warm waters flowing past it on which pelicans and storks land each morning! At night, if you look to your right down the canal you may spot an elderly gentleman doing a spot of night fishing, if you look to your left you'll see more water and more palm trees and exotic shrubs. The whole house is thickly carpeted with a good tough hardwearing high quality carpet, and the kitchen has everything - and more, a holidaymaker could need including a huge fridge and well stocked drawers full of cooking implements, dishes of all sizes, glasses, mugs, cups, pots pans and baking trays galore. We stayed 5 nights and also use a local company to get around so we did have to drive . Tampa limo. We were there for the hurricane and that was interesting. Looks are deceiving, not very appealing as you pull in. We booked last minute and Jack was very accommodating. The home is spacious and very well equipped. Great canal view with fish jumping and manatees swimming by. This was a roomy short term place in between homes for us! A family of 5 stayed comfortably and Jack was such a sweet and generous guy! Thank you for making the crazy transition between homes a little easier! I would highly recommend this home and this owner!!! Thank you again for everything Jack! Second time back and we still love it! Nice and quite with a canal in the backyard to relax after exploring Florida. We also like the location because of all the grocery, restaurants, and shopping close by it! 10 minutes to Raymond James Stadium, home of the Tampa Bucs. 10 minutes to the NY Yankees' winter home. 20 minutes to the downtown Tampa Convention Center. 20 minutes to Tampa Bay Lightning hockey and concerts at the St Pete Times Forum. 30 minutes to historic Ybor City or Channelside nightlife. 30 to Tropicana Field a Rays baseball. 20 minutes to the Florida Aquarium or Busch Gardens & Adventure Island. 90 minutes to Orlando and its many attractions.